There is a wind farm in northern VT that has had times when the grid would not accept the power when the wind was blowing. Perhaps they can solve such problems in the future but they do exist. . Other solutions proposed sound good on paper such as adding more turbines to hydro dams but when you actually look at the cost of a retrofit and the fact that there isn't any more water to run through it and the damage down stream the increased flow would cause all make it dubious at best. Same for off river pumped storage. The site has to be purchased and people and buildings cleared off and a reservoir built with the pipe between it and the low water source. Add in the losses up and back and there isn't much net energy left. If you really need it and cost is no problem you can but cheaper solutions need to be found. I do think there will come a day where factories work some process only when cheap RE is available and sit idle when the wind is calm or at night." Make hay when the sun shines" is an old farmers rule that will move to the factory floor. "factories work some process only when cheap RE is available and sit idle when the wind is calm or at night"
dohboi wrote: "factories work some process only when cheap RE is available and sit idle when the wind is calm or at night"
That would work best with fully automated processes where a computer or robot just flips the switch without having to call in a crew on short or variable notice. Yes, robots will save us all! dohboi wrote: Yes, robots will save us all! Only if we find a way to make them pay enough taxes to support all the people the robots put out of work. But since they are probably already in charge, they may not allow that particular bit of legislation to go through! Really, how will we/would we know if/when the 'singularity' happens/has happened?? dohboi wrote: Nice idea...TAX THE ROBOTS!!! Oh probably things will suddenly start running a lot smoother. I'm not afraid of the singularity because the robots have no built in greed or desire to dominate. That exact choice will be forced upon us all much sooner than many realize. The "smart" thing to do would be to plan for it, and adjust not just the energy usage, but also the population to fit into the available energy. The old adage here, <i>Those who fail to plan, plan to fail</i> will come true with disastrous consequences. If trying to fight the disaster that will be CC can help us get to a population level consistent with the available energy resources in the next 20-50 years all the better. Funny you keep harping on FF when population is the real problem. PS the US refused to modernise their steel production facilities, just as the electronic industry tried for far too long to keep people using vacuum tubes instead of adapting to the transistor era. Both industries ended up in the far east, for two reasons. 2. The same in electronic devices, transistors were less costly and easier to produce in mass,and the circuits were much smaller (and in many ways more robust) allowing a more modern smaller device to replace devices that American electric corporatisations wanted to keep tied to the vacuum tube because their shorter term profits were tied to the sale of vacuum tubes. Thus by the end of the 1960's the electronic consumer production market moved to Japan then the rest of Asia. Same economics allowed the better cheaper more robust device to supplant the old vacuum tube device. 3) Force people to change to low energy lifestyles via taxes, etc. Example: 100% gasoline and diesel tax, doubling motor fuel costs. This will reduce FF use and prolong the limited supplies of FF's. Why taxes?????????????? Very inefficient. Were taxes used to get the implementation of seat belts, air bags, better crumple zone designs in autos?? NO but what was used worked. Push for a more robust local production of electricity,and make it much less expensive and easier for people to install individual production at the user level and many changes because of economics will happen, just like the car replaced the horse and buggy. If most people had solar panels ETC at their homes, making the cost of filling up the electric car much cheaper in the long run 2-3 years at best, it would be a no brainer vs buying gasoline off somebody else. Also if the solar industry wasn't fought against tooth and nail by both the oil corps and their bought and paid for politicians. If the idiot Reagan knew a little more than how to act, when he won he might not have push the US away from the transition from fossil fuels, but given who he surrounded him self with a oil based VP and lots of oil based cabinet officers,with his enormous cluelessness on how the world was developing,half the crap he sqwaked about was from the 40-50's time in hollywood. 4) Do you have another alternative? NO, you don't get to postulate a magical new energy source without carbon emissions, you have to stick to current technology. Funny how the debate is limited by YOU. The alternate is the change the system at the same time we are trying to change the ignorant way we are proceeding to a very very bad result IF we do not change. Get money out of politics, and return back to the style of taxation that existed when the country was working much better for ALL. Getting the money out of politics will get the ability of a very few people to buy politicians like the Koch brothers have Mitch McConnell in their pocket. How with the Mercers steeping out of presidential politics Sheldon Adelson is the person trump will look to for major financing, hence his move of the Israeli embassy to the location Adelson has wanted for years. Remove money and McConnell has to ask for votes on a level playing field. So do lots more people who right now have 8-10 major pacs to please. With people like the congresswoman from the Bronx offering different ideas people are starting to see a different way. BTW lots of the rest of the planet including China most of Europe are working to move their transportation systems away from ICE,so we have a choice. or move into the 21st century. Cortez the Democratic Socialist is your new hero? Oh my God. We are so doomed. Outer space has nothing on the hard vacuum going on inside her head. 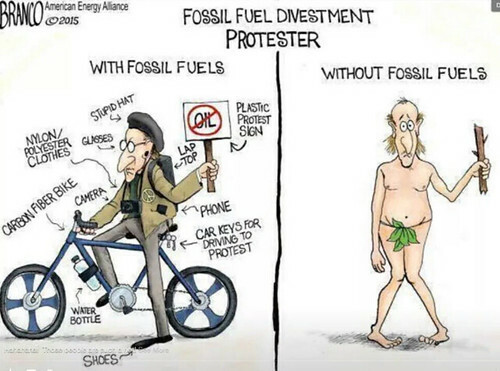 The amount of fossil fuels is limited. We are no longer finding fossil fuels faster than we are removing them from the crust of the planet, and using them. So at some point we are going to see a decline in the production of fossil fuels, at that point we have a choice to make. Find a way to find an alternate energy source to replace the declining amount of fossil fuels available for food production and transportation etc necessary for the extra 6 billion people, or hopefully we had planned a decline in population by some humane way IE lowering birth rates enough to keep ahead of declines in food production etc. Otherwise a very unpleasant scenario seems the only option at that point. It's a corollary to infinite growth is impossible in a finite planet, both are true. Thus planning for the time we will lack fossil fuels seems to be the only both humane and intelligent choice we have. This is what gets me. We have a clear choice with the added bonus of mitigating climate change and yet all I see is industry funded denial of the science and delusions about BAU lasting forever. For some reason the horse buggy manufacturers left the scene without trying to foist horse driven transport in the face of the advent of mechanized transport. But the oil majors and they proxies are doing exactly this. They know that their jig is coming to an end fast, but they spend hundreds of millions of dollars to lobby politicians and spread FUD to the public that paralyzes adoption of new energy technologies and helps humanity to reduce global warming. Storage of various sorts is also developing quickly. And of course, the wind is always blowing somewhere, as is the sun shining. So a combination of load management, enhanced transmission, increased efficiency, more and better storage, and more RE generation should be able to get us pretty darn close. I do think we need to also shrink as well as to decarbonize the industrial economy. But that would probably get us off in a different direction, even further afield from the threads direct topic. It was fully approved....Obama called it "shovel ready" and vowed to "expedite construction"....but the powerful Kennedy/Shriver clan percieved a flaw: The windmills would just have been visible on the horizon from their family compound in Hyannisport. Therefore the Kennedy/Shriver clan formed an alliance with the Koch Brothers, the arch-conservative Republican suppliers of coal to East Coast power plants, and halted the project. "... the horse buggy manufacturers left the scene without trying to foist horse driven transport in the face of the advent of mechanized transport..."
No, today one billion do not have that...was that really progress? dohboi wrote: No, today one billion do not have that...was that really progress? It has been for the other six billion. Do you eat nothing but vegetables that you have planted yourself, not used any metal gardening tools for weeding or harvesting, not used any chemical fertilizers? Answer is possibly..followup question would be what the hell for? Do you work someplace that never benefited from hydrocarbons? Answer is almost certainly no. Honestly the smug...."OH, those horrible oil companies" ....statements that the green left make here when their whole lifestyles were a product of those companies is unbelievable. The four warmest years in the terrestrial instrumental record are the last four years. There is a fair chance 2019 will set a new record for global warmth. El Nino years tends to be unusually warm, and planet is setting up for 2019 to be an El Nino year. Combined with ever higher CO2 concentrations in the atmosphere, the stage is set for 2019 to be the warmest year ever recorded on earth. I've shifted my annual trip to visit friends and travel in the western states in the lower 48 to early October to try to avoid the toxic smoke from western forest fires. I used to go in August every year, but every year it's been hotter and hotter and smokier and smoker, and now its gotten to the point that cities and even whole areas are virtually shutting down due to the toxic smoke from the massive forest fires every summer. Hopefully the huge forest fires we are seeing all over western North America --due to what has become the annual tendency towards extreme summer heat and drought-- will be mostly out by early October. But really, Plant, what the He!! else would you expect? We have fossil and ice core and tree ring evidence of 262 Glacial/Inter-glacial periods, the last Glaciation peaked 21,500 years ago when there was so much ice that sea levels were 120m lower than today. Since then we have been in a warming trend, as we approach the Climatic Optimum. The last four Inter-glacials lasted about 20,000 years of which 10,000 to 15,000 years was a stable warm period. The present Inter-glacial warm period began 11,700 years ago, the Climatic Optimum will occur in 1200 years or so, if the average holds. Thus a warming trend is expected for another 1200 years. Check, things are warmer on the surface of the planet. But the Earth-facing satellite temperature data is only about 35 years old, and shows a cooling trend. The usual case holds, different datasets display different trends. That's what feeds the CC debate at peakoil.com.